A quick disclaimer before I start… the photos below are snapshots, some taken on my phone and others taken from a moving car – they are here to illustrate the words not as a form of art in their own right. Today’s run started from Tescos at Llandudno Junction but the places that we visited can easily be found from other starting points in North Wales. This is the route that we took. I may have inadvertently changed a junction but the outcome is the same. There were about 9 cars (I didn’t count) – you’ll see some of the cars in the photos. We headed away from Llandudno and up into the lanes above Glan Conwy and along the tops of the hills above the Conwy valley. It’s a bit steep and narrow getting up there but well worth the effort. The view across to the Carneddau and beyond was spectacular but due to the haze a photo wouldn’t have done it justice (doubt if you would’ve seen what I’m on about). 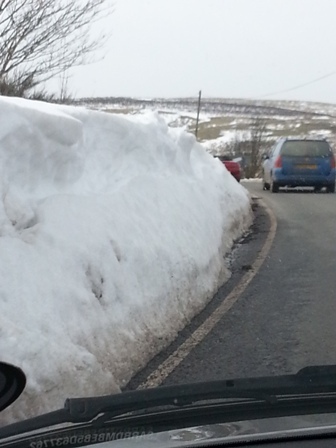 Loads of snow still on the mountains and there was lots of evidence of how deep the snow had been along our route. 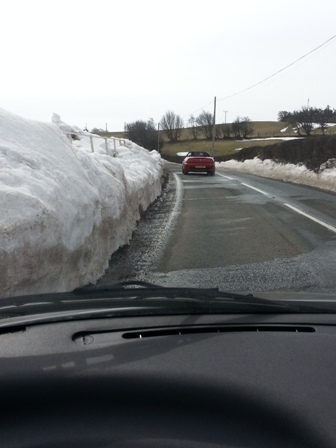 There were a couple of places where we could see lanes still closed by snow… and it came down more than 2 weeks ago! 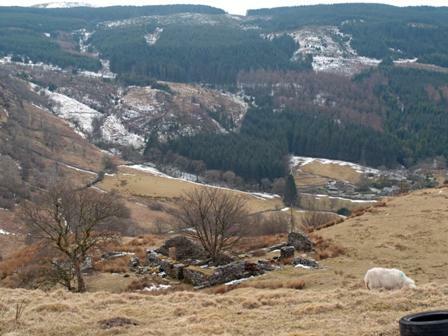 Our leader for the day led us across hills and moorland, through places that we recognised and some that surprised us – I’d never heard of Llansannan but it’s quite a big place (sorry residents of Llansannan!). 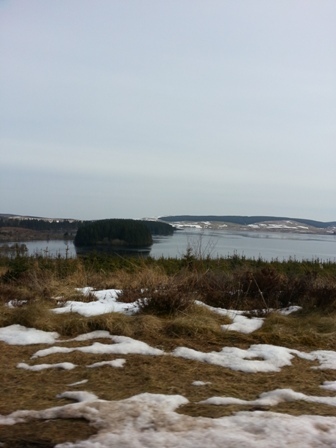 Eventually we came out on the Denbigh moors and headed for Llyn Brenig Visitor Centre for our coffee break. 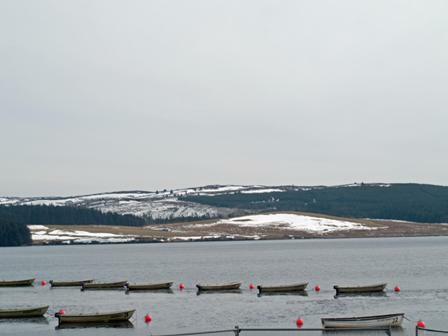 I’ve driven down the B4501 loads of times (mostly in the middle of the night) but have never stopped at Llyn Brenig – I was surprised how big it is and there’s obviously lots of fishing going on there. There looked to be small boats with outboard engines for hire and some sort of fish breeding “cages” out in the middle. There also seems to be a fair amount of mountain biking in the area given the muddy cyclists buying bacon rolls in the cafe! Here’s the link if you’d like to find out more information. We parked up and checked that we hadn’t lost anybody along the way. 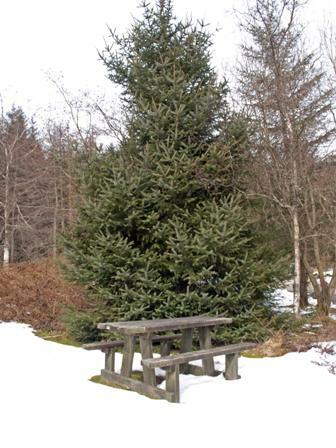 It wasn’t quite warm enough to sit outside as there is still quite a bit of snow about but I imagine that it must be lovely on a warmer day. 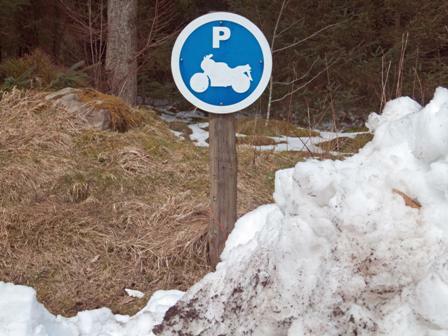 Was wondering what the motorcyclists thought about the car park all being cleared of snow except for their spaces? After our break we were back on our way again. Still lots of miles to cover before lunch! We headed back out onto the Moors again and eventually hit the A5 for a very short stretch before turning off towards Pentrafoelas. There’s a 40mph speed restriction on the A5 at Pentrefoelas and we spotted a (probably) frustrated traffic cop just beyond where we turned off the main road. He must’ve thought that he was going to catch at least one of this convoy of MGs doing more than 40… but not today! Another quick check that nobody had missed the turn and we were back off across the countryside again. 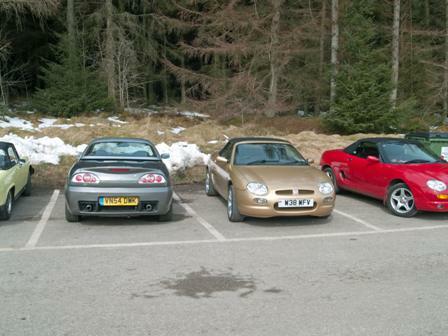 As you can imagine a convoy of MGs can take people by surprise. 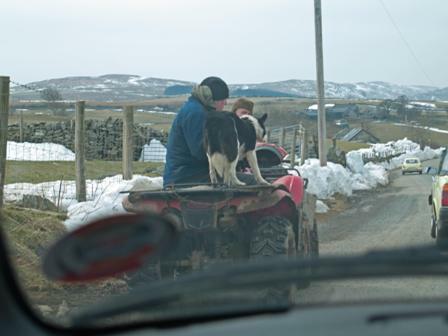 Our group today didn’t cause too much of a stir but these farmers and their dog weren’t quite sure how many were coming down the road. We went through the village of Ysbty Ifan.. If you know any welsh then you’ll know that “ysbty” means “hospital” and there’s certainly no hospital in this tiny, picturesque village. Well this reference dates back to the Knights of St John who founded a hospice here in 1190. Find out more here. Our trip continued out across the moors again. This lonely road across to Pont yr Afon Garn is amazing! 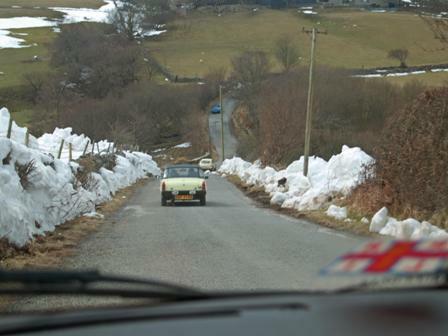 It is difficult to believe that there could still be a road in North Wales where it is possible to drive for so long without any signs of civilisation – no pylons, no fences, no houses… try it and see! 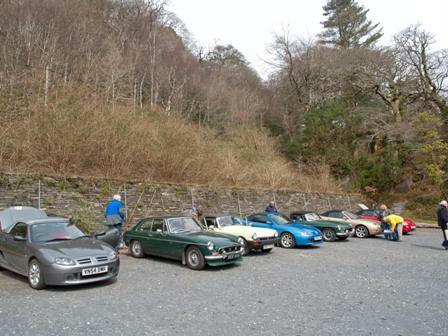 The cafe at Pont yr Afon Garn had a sign out to say that it was open… that’s a sure sign that it must be nearly Summer. On a clear day the road from this point down to Llan Ffestiniog is a joy with views over the Moelwyns, the Rhinogs and as far as the coast. Today was hazy and not so spectacular but very pleasant. 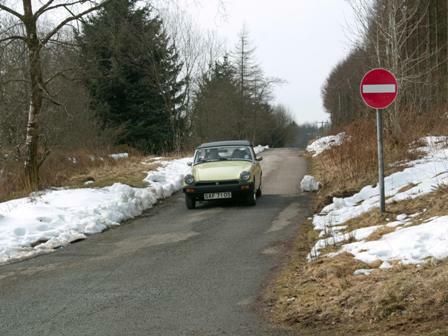 There is a car park and view point along this stretch of road but it is unsigned and has a narrow entrance between two big stone walls. 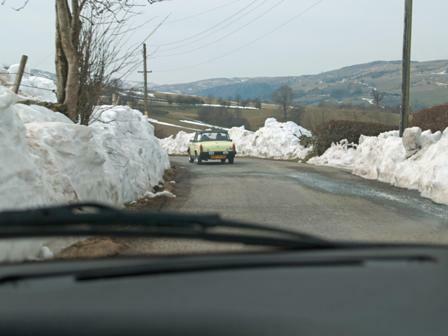 We managed to duck in there (much to our convoy’s surprise) as we knew where it was… keep your eyes open for it. This is a photo looking down the hill. Much better views to be had on a better day. 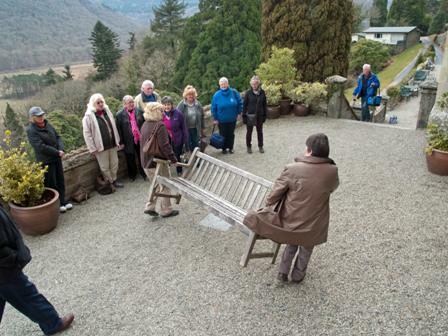 After this we carried on down the Vale of Ffestiniog to Plas Tan y Bwlch at Maentwrog. If you’re turning into Plas Tan y Bwlch pull into the layby on the left and then cross the main road into their entrance like a cross road. I think it’s safer that way. Quick check around the car park… yes – everybody has made it to our destination! We walked up to the main house through the gardens. I think due to the recent cold snap, all of the Spring plants are running a bit late but it was a pleasant enough walk. 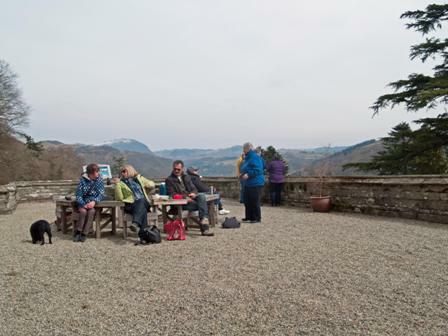 Some of the group decided to brave the terrace for their picnics whilst others decided to sit inside in the Conservatory. 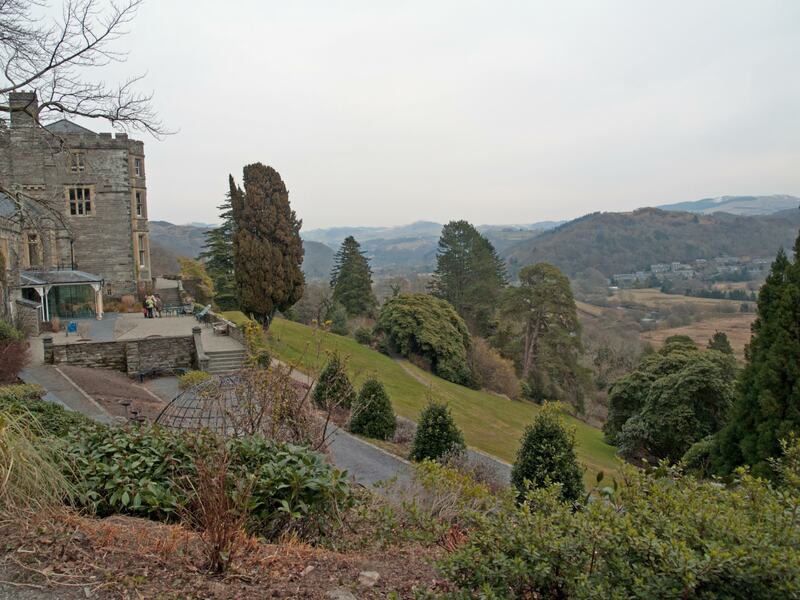 The view from the Terrace is wonderful – but needs a sunny day to do it justice in a photo. 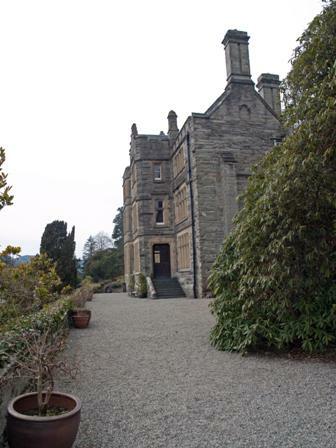 There is no entrance fee for the house or gardens and there are lots of walks around the grounds. The House has its own halt on the Ffestiniog Railway and we were lucky enough to see a train coming through the mountains, down the Vale of Ffestiniog towards us and hear it blow its whistle as it went around the back of the house. And the obligatory group photo… some people will try to pinch anything! So there you go! 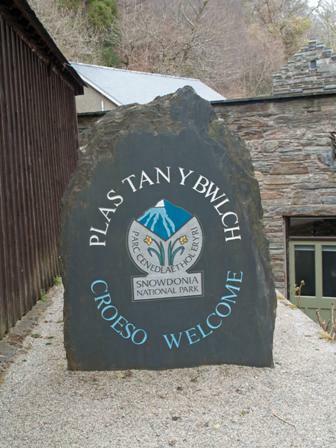 Would thoroughly recommend Plas Tan y Bwlch for a visit during your stay at Cadair View Lodge. It’s about 15 minutes drive away. It’s a pleasant way to spend an afternoon. There are self-powered audio points through the gardens to give the information about what’s around you. The Oakley Arms or The Grapes are local recommended places to eat. 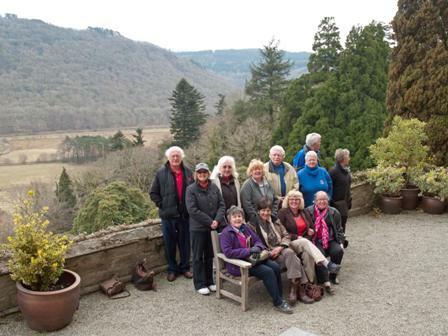 Categories: Days Out, Family Break, Romantic Break, Short Break, Snowdonia, Uncategorized, Walking | Tags: bird watching, Cadair View Lodge, Carneddau, Conway, Conwy, Festiniog Railway, Ffestiniog Railway, fishing, Hiraethog, Knights of St John, Llandudno, Llandudno Junction, Llansannan, Llyn Brenig, Maentwrog, MG, MG Owners' Club, motorbikes, mountain biking, mtb, Pentrefoelas, Plas Tan y Bwlch, Riverside Chocolate House, snow, snow drifts, Snowdon Run, Snowdonia, Snowdonia National Park, The Grapes, The Oakley Arms, Ysbty Ifan | Permalink.